How do you go about finding people for your child to talk to in an informational interview? You tap into your own network of contacts. You identify the networking contacts you already have and help your child make career connections with those contacts. Networking as a job-search strategy addresses the fact that 70 percent of jobs available at any given time are never advertised in traditional forums, such as newspaper want ads or career/job Web sites. Most jobs are found by word of mouth, or networking. To network in the job-search process means to get your name and qualifications out there to as many people as possible so that those people think of you when “hidden” jobs open up. You may find the idea of networking intimidating at first. If you haven’t had to look for a job recently, you may think networking is beyond your ability. But networking is just a structured way of getting and giving information about jobs and careers. Everyone has a network. To understand your own network, think of eight working adults you know. These people can be family members, friends, co-workers, or neighbors—anyone you are comfortable talking with on an informal basis. 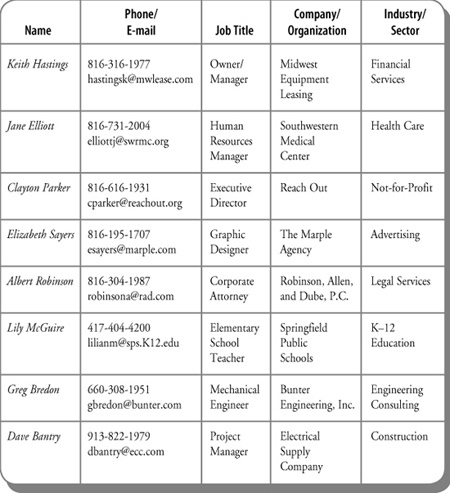 Write the names of these people on the My Network worksheet. 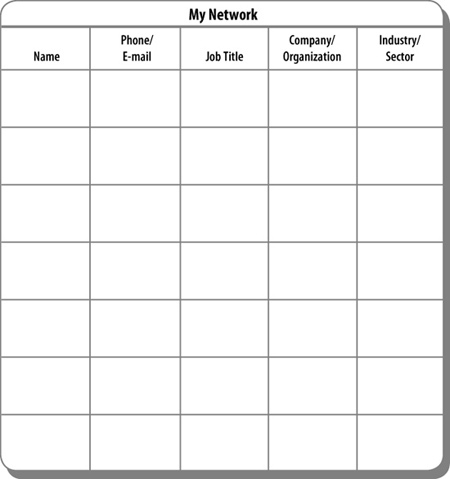 Complete the worksheet with information about each person. The following worksheet shows you Jeff’s network. • The job duties of a sales manager. • How to run a successful small business. • The equipment leasing industry in general. • Sales as a profession. • The financial services sector of the economy. • Where the leasing equipment industry is going in the future. • The specific education and work experience Jeff would need to get into the leasing industry. • The job titles and duties of other employees at Midwest Equipment Leasing. • How Jeff could get hired at Midwest Equipment Leasing Company. • Her job duties as an HR manager. • The names of people working in a variety of other health care careers, including nursing, respiratory therapy, hospital administration, physical therapy, and so on. • The field of human resources in general. • Trends in hospital administration. • Whether Southwestern Medical Center is hiring. • How Jeff could get a job or an internship at Southwestern Medical Center. • The names of other HR managers in the area who are members of her professional organization. • The role of an executive director in a non-profit agency. • The field of social services in general. • The not-for-profit sector of the economy. • The different kinds of jobs that are part of an agency such as Reach Out. • Contacts with other people working in social services. • How to revise his resume to make it more effective. Keith, Jane, and Clayton are all part of Jeff’s network. Everyone has a network. If you identify the members of your network, they can provide informational interviews for your child. They can help your child brainstorm career ideas and uncover additional job titles to research. Members of your network can provide your child with three kinds of interviews that are part of the job-search process. These include informal interviews, informational interviews, and job interviews. Informal interviews are conversations with family and friends to brainstorm ideas and get job leads. The purpose of an informal interview is to get ideas and get the names of people to talk to. These new contacts can help your child explore a career, identify a career objective, or find out how to get hired at a particular company. Informational interviews are more structured conversations than informal interviews. They are designed to help your child get specific, firsthand information about a career or about the company a person works for. The purpose of an informational interview is to get information. It is not to get a job. An informational interview will give your child accurate, detailed information about a career, as well as suggestions for people to talk to next. A job interview is a formal interview in which your child sells her skills and qualifications for a particular job. A successful job interview requires that your child know her skills and how to communicate them both verbally and on a resume. It requires that she know how her skills will benefit the employer. The informal and informational interviews your child conducts before a job interview will increase her ability to sell herself in a job interview and get the job she wants. Ultimately, your child will decide where she wants to land on the economic ladder. Informational interviews will help her identify the education and work experience she will need to be successful at whatever goal she chooses for herself. But what if you want more ideas for your child to research than her initial informational interviews provide? Isn’t there a test that can tell your child what to do? It is not your job to decide the merits of your child’s career ideas. It is your job to facilitate the information gathering. To be effective in your role, you need to get out of power struggles with your child over career decisions. Informational interviews help you do that. They let your child do a reality check on her career ideas with someone other than you. They let life be the teacher. Your job is to let the teaching happen. One way to ease into the informational-interview process is to have your child conduct an informational interview with you. Most young people are relatively clueless about what their parents do for a living. One thing that sometimes holds parents back from encouraging career exploration is the unspoken fear that their child’s initial goal is unrealistic. Some parents secretly think that an unrealistic goal is better than no goal at all. If you know your child doesn’t have the math skills or motivation to become a pharmacist or engineer, is there something more constructive you can do than send him off to college, knowing he will fail? Encourage your child to begin career research early. Career research can, and should, begin in high school. This research will help your child evaluate an initial goal and move on, if necessary, to other, more achievable goals. Every student, even the most gifted and talented, needs a Plan B. Life happens. By engaging in career research early, your child can identify several career paths and have a Plan B ready if Plan A doesn’t work out. Looking at the distribution of jobs by education and training level in Chart 2, you may be wondering why everyone, including teachers, counselors, parents, politicians, and the media, is telling all high school students they need a college degree to be successful. Even if every high school graduate in the U.S. earned a four-year college degree, the percentage of jobs requiring a bachelor’s degree for entry into the career would still be only 12.3 percent. And if all those college graduates went on to pursue a master’s degree, that wouldn’t change the fact that only 1.7 percent of all jobs require one. Part of the problem is that many people simply aren’t aware of the actual distribution of jobs in the labor market. They are often shocked to realize that more than 52 percent of jobs in the U.S. require less than one year of on-the job training. In addition, many people do not differentiate between job openings due to growth and job openings due to replacement needs. Job growth reflects newly created job openings that did not exist before. Job replacement reflects job openings due to workers leaving existing jobs. Job openings from replacement needs are projected to be more than double the numbers of job openings due to economic growth between 2008 and 2018. Finally, as well-paying manufacturing jobs disappeared over the last 25 years, many people came to believe that a college degree is the only sure route to a comfortable and financially sound life in the middle class. Even this deeply held belief has been challenged in recent years as hundreds of thousands of white-collar workers with college degrees lost well-paying jobs during the recession. All of this raises some important questions, such as What is a college degree? What is middle class? There are many paths to a postsecondary education these days: traditional colleges and universities, community colleges, proprietary schools, career/technical centers, and online programs of all types. And with a wide array of economic outcomes for each educational credential, it’s clear you need to think long and hard about the kind of education and lifestyle you want for your child. Rather than tell your child, “A college degree is the door to the middle class,” point out that developing marketable skills is how people become financially successful in life. This is true whether their educational credential is a certificate in wind energy technology or a master’s degree in social work. By emphasizing skills, you are able to make better decisions about how to spend and stretch your educational dollars. Marketable skills can be acquired through a variety of educational and training venues, including a four-year college or university, a community college, a proprietary school, a career or technical training school, work experience, graduate school, and the military. You need to teach your child that acquiring skills is not a one-time, one-shot event signified by earning a degree or certificate. Rather, it is a lifelong learning process in which each new job and life experience offers an opportunity to learn more skills and make new contacts. In times of economic downturn, it is easy to lose sight of the fact that there are still people who are employed, and these people are a valuable source of information about which jobs will be available for entry-level workers when the economy loosens up. People you know who are employed are part of your network. One of the most helpful things you can do is encourage your child to meet with members of your network to identify the skills, education, and work experience needed to be marketable in a variety of entry-level jobs in different sectors of the economy. Identify one person you know who has a job. This person is a potential resource to your child about a variety of career-related topics, including the day-to-day duties of the job, the education and work experience needed to be hired for an entry-level position, the pathways to better-paying jobs in this career field, and the “big picture” with regard to the future of this job and industry in a global economy. Don’t forget you have a network, even in tough economic times. Use your network to help your child connect with information and opportunities.